With e-commerce exploding, retailers (sometimes called e-tailers!) have an increasing need for warehouses to store their goods for shipment. And one of the biggest needs in warehouses is speed. While robots are increasingly being used in warehouses, there will always be human workers, and worker safety will remain paramount. Will there be a growth in the number of warehouse workers? And what about fatalities and injuries? Let’s take a look at some numbers. A recent fire at a plastics recycling warehouse in Parkersburg, West Virginia, led to the governor declaring a state of emergency. Although no one was injured, the environmental agencies in both West Virginia and Ohio decided to continuously monitor air quality in the area. A worker at a bulk wholesale warehouse was fatally injured after falling 7 feet from a wooden pallet elevated by a forklift. The warehouse inventory was stored on steel storage racks with the highest shelves about 8 feet above the concrete floor. It was common practice for warehouse workers to place one foot or both feet on a pallet and move inventory on the top shelf while a coworker lifted them to the top shelf using the forklift, even though the equipment was not designed for this purpose. According to the Occupational Safety and Health Administration (OSHA), there was no training provided to the workers. According to the latest numbers, at this writing, from the Bureau of Labor Statistics (BLS) there are over 960,000 workers (numbers are seasonally adjusted) at warehouse and storage facilities nationwide. The bulk of these workers are employed as laborers, freight stock and material movers and handlers, and forklift truck and tractor operators. BLS projects the employment of hand laborers and freight, stock, and material movers to grow 8 percent from 2016 to 2026. Although some warehouses are installing equipment such as high-speed conveyors and sorting systems to increase efficiency, these workers will still be needed to move materials in nearly all sectors of the economy. BLS projects the employment of forklift truck and tractor operators to grow 7 percent from 2016 to 2026. Employment of this occupation is concentrated in warehouse environments. The demand for warehousing will continue to grow as more consumers choose to purchase products online. However, according to BLS, employment growth may be tempered for industrial truck and tractor operators as more warehouses begin using automated machinery to improve their operations. In 2015 (latest statistics), there were 11 fatalities at warehouses and storage facilities. This is down from 17 and 16 in 2013 and 2014, respectively. 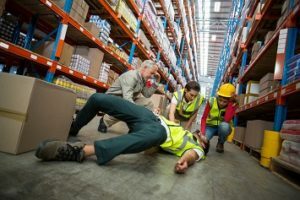 The rate of recordable cases of nonfatal injuries and illnesses in 2016 for warehouses and storage facilities was 5 per 100 fulltime workers, higher than the all-industry average of 3.2/100. In 2016, cases involving days away from work, job restrictions, or transfers (the DART rate) was 3.7/100 for warehouse and storage facility workers, higher than the all-industry average of 1.7/100. What can a warehouse EHS manager do to make certain that workers are safe? Check tomorrow’s Advisor for the most common injuries at warehouses and how to avoid them.